NAF Five Star ProFeet is so effective as it contains biotin; methionine; MSM; cysteine; lysine; calcium; zinc; essential fatty acids, which aid healthy horn development & Vitamins B6, C & E, which act as anti-oxidants. 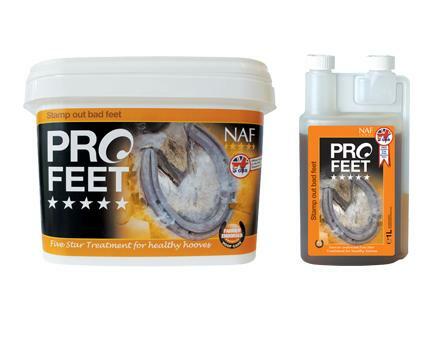 NAF Five Star ProFeet is available in liquid or powder form. Feeding Instructions- Feed the full amount to horses with bad feet & feed "Low maintenance" rate to maintain healthy hooves. Powder: 600kg+ feed 44g daily 400-600kg- feed 33g daily Low Maintenance- feed 22g daily Ponies- feed 22g daily Low Maintenance- feed 16g daily 1.3kg will last upto 39 days (based on 33g daily) 2.6kg will last upto 78 days (based on 33g daily) Liquid: 600kg+ feed 30ml daily 400-600kg- feed 25ml daily Low Maintenance- feed 15ml daily Ponies- feed 15ml daily Low Maintenance- feed 10g daily 1 litre will last upto 40 days (based on 25mls daily) 2 litres will last upto 80 days (based on 25mls daily) 5 litres will last upto 200 days (based on 25mls daily) NAF is part of the BETA NOPS scheme.